This month, Keurig Green Mountain is launching what the brand calls its 2.0 brewer packaging initiative to more prominently communicate that the Keurig 2.0 system has more than 500 varieties across more than 70 brands, including the top 10 brands. It expects this messaging to help clear up the misperception that the system only brew's Green Mountain or Keurig-owned brands. Keurig Green Mountain is teaming with AOR Havas Worldwide to introduce a multi-faceted campaign promoting the fair-trade certified Laughing Man, its newest K-Cup format. With hundreds of brands to spotlight, executives selected Laughing Man for several reasons. First, the coffee company was founded by actor Hugh Jackman and can leverage his high-profile celebrity. Also the Laughing Man coffee brand is relatively unknown outside of New York City and will benefit from national exposure. The Keurig brand is now synonymous with single-serve coffee brewing and this creative will expand to more philanthropic issues. 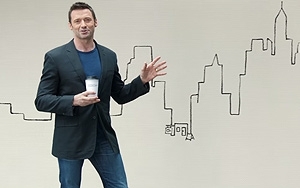 "We needed to tell the Laughing Man story in an authentic, compelling way where Hugh Jackman's personal brand champions it without overpowering it, and why partnering with Keurig is the next exciting chapter of this story," says Alla Gonopolsky, planning director, Havas Worldwide New York. "Hearing Hugh talk firsthand about why he started Laughing Man, we instantly knew this was no 'celebrity endorsement' but a venture that was deeply personal to him, and one that Keurig could now help share with millions of coffee lovers around the country," she adds. The creative is designed to feel "very human, humble and optimistic, while doing justice to the premium, distinctive taste of the coffee itself," says Gonopolsky. The messaging explains the origins of Laughing Man, when Jackson met a struggling coffee farmer named Dukale during a trip to Ethopia, the birthplace of coffee. Dukale’s infectious spirit along with his incredible coffees moved Jackman and his friends to open a fair trade coffee shop in NYC called Laughing Man. The campaign includes digital pre-roll videos, digital banners, social media, with in-store elements rolling out later this summer (one spot can be seen here). MNI Targeted Media, Cone and Motiv were brought on board to handle the Media, PR and In-Store, respectively. In addition, Jackson and Dukale are featured in "Dukale's Dream," a documentary about the importance of fair trade coffee. This film is currently running in select theaters and will be available on video on demand beginning Tuesday, July 14. A key challenge was to maximize the exposure and cultural impact of this content, with the coffee being sold online-only until the fall, says Gonopolsky. "While the videos will run as pre-rolls and digital video ads in targeted placements, we are trying to balance e-commerce goals with cultural relevance by leaning strategically on social media, harnessing the collective power of Keurig and Hugh Jackman's passionate fanbase." Although Keurig does advertise its Green Mountain varieties on occasion, the brand's focus has historically been more on the overall system of brewers coupled with its ever-expanding variety of coffee, tea and hot cocoas available in K-Cup pods. "The individual beverage brands of course have their own great stories to tell, and their own devoted customers," says Gonopolsky. "Some are extremely well-known already - Starbucks, Dunkin Donuts, Peet's, Green Mountain - but with lesser known brands like Laughing Man, Keurig wanted to spotlight the latest new addition to its family and help bring awareness to the inspiring story of Laughing Man's humble beginnings and its optimistic outlook on the world." Keurig Green Mountain spent $137.2 million on advertising in fiscal 2014, down from $193.2 million and 147.7 million in fiscal 2013 and 2012, respectively, according to company financial filings. This fall, the company plans to introduce Keurig Kold, its cold system that will brew both warm and cold beverages in the same machine. To support this new category, the brand has signed a 10-year agreement with Coca-Cola to introduce a line of drinks to this system. Havas was named AOR for Green Mountain Coffee Roasters in December 2013.